You get all stories under one roof, that’s right, under the Vogue Hommes International Mode magazine. It ensures to review all of the film releases of a particular month including those too which have a limited release unlike the ordinary magazines which focus only on the films with a general release. It is an ‘all possessing’ magazine complete with film, music and all the latest celebrity gossip and which caters especially to men’s style and class. You get all stories under one roof, that’s right, under the Vogue Hommes International Mode magazine. Not many lifestyle magazines cater to the needs of male readers and that is what makes it different from the others. It relates its readers to the latest on goings in the world of fashion. Guiding them to pick the right colors of the season to picking up the right shoes and the right amount of jewelry, Vogue Hommes International Mode magazine is a real afternoon delight! The magazine publishes the most authentic and the most detailed movie critics for its readers so that they are well acquainted with reality. Not only is this, for all those movie buffs, there exciting promo stills from the latest and upcoming movies. How can music be far from Hollywood and fashion! 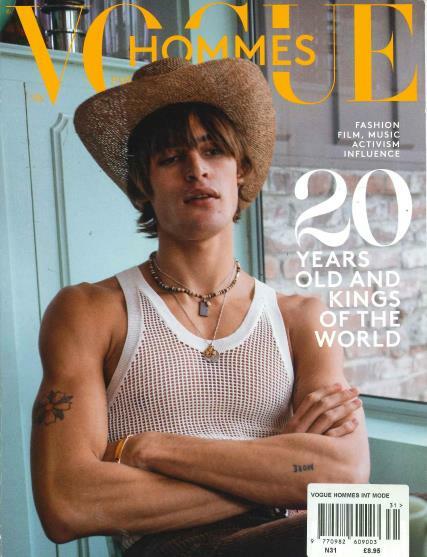 Vogue Hommes International Mode magazine also sees to the needs of its musical fans. i LOVED IT IT IS AMAZING!! !